At an exotic pet store, a boy picks out a rhinoceros as a pet. But when he gets the rhinoceros home, he realizes that his pet really doesn’t do anything at all. He won’t chase balls, or sticks, or frisbees. He doesn’t roll over. He keeps to himself and is very quiet. So the boy asks a rhinoceros expert what the problem is. She informs him that rhinos only do two things: pop balloons and poke holes in kites. The boy thinks that that is completely pathetic, but he decides to test it out. He heads to the park where there was a balloon vendor. Nothing. Then they walk past children flying kites. Nothing. Maybe his rhinoceros is a clunker? Until their walk back home, then suddenly his rhinoceros does amazing things, but you will have to read the book to see what they are! Agee has a wonderful knack for taking a simple idea and running with it to the extreme. Here the concept of buying a pet and figuring out that pet is taken to a wild and amazing place. Agee allows the situation itself to provide the humor, making it more subtle and understated than many children’s books. So while this is a wild and zany book about rhinos, it also has an air of sophistication about it. Agee’s illustrations are also an important part of his books. His unique style is done in thick black lines and washes of color. The illustrations are almost like coloring books at times, if coloring books were cool and about pet rhinos. Another winner from Agee, children who read this book may want to find their own exotic pet, probably a rhinoceros of their very own. It’s also a perfect surprise addition to story times about pets. Appropriate for ages 4-7. Also reviewed by A Picture Book a Day. 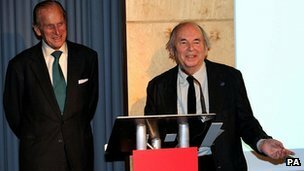 Quentin Blake has won the Prince Philip Designers Prize, winning over fashion designer Paul Smith and hat designer Stephen Jones. "Illustration is a strange cousin in the family, so to appear alongside other kinds of designers… is very gratifying," he told the BBC. Blake was the first ever British Children’s Laureate in 1999. He is the beloved illustrator of Roald Dahl’s books.